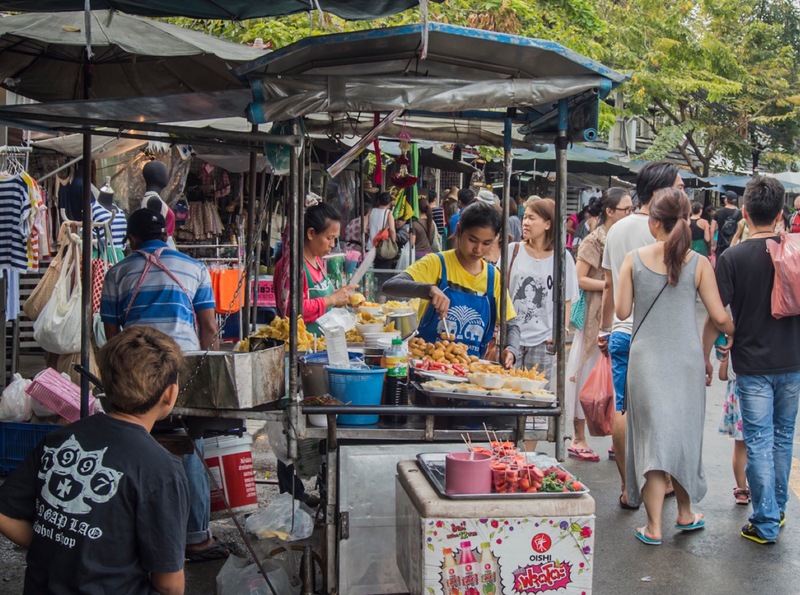 In yesterday’s post I only wrote about the market stalls at Chatuchak Weekend Market, but I did not mention the different food stalls – and the sheer amount of them and the different variety of food on sale is worth an extra blog post. 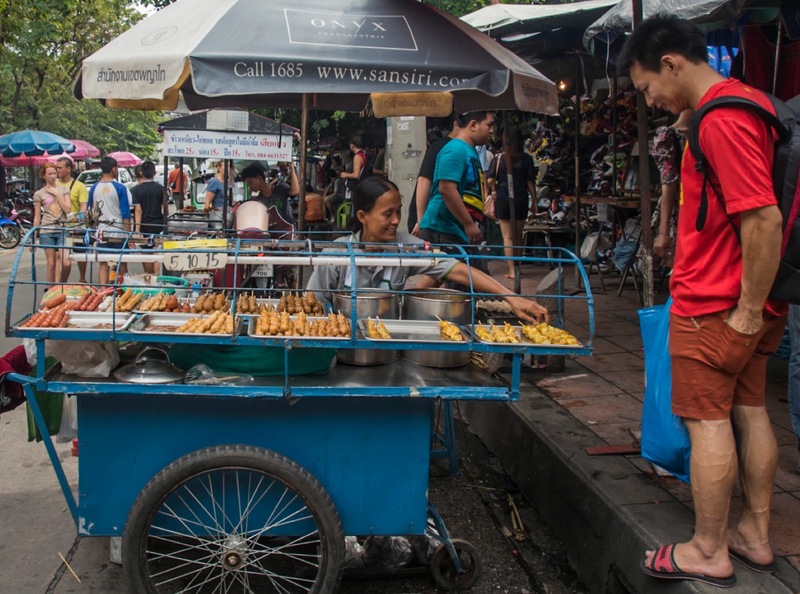 There are specific food sections where you can purchase food and drink, but throughout the market are many small shops selling something to eat and drink, there are even a few carts being pulled through the walkways that sell ice cold drinks and quick snacks. You can get almost anything and most of it is freshly prepared. 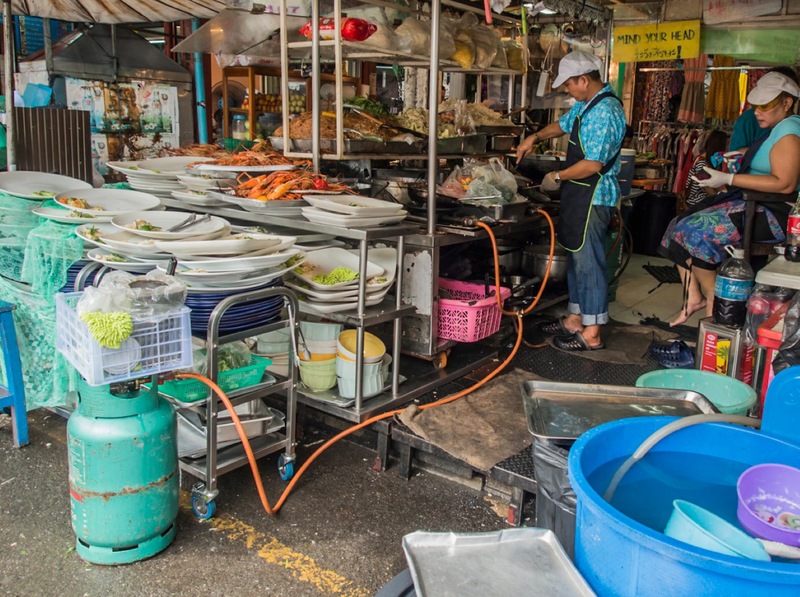 From grilled satay over freshly made fish cakes (that’s what the two ladies are preparing in the picture above) to authentic rice dishes with and without curry, there is almost anything everything being boiled, grilled and fried here. 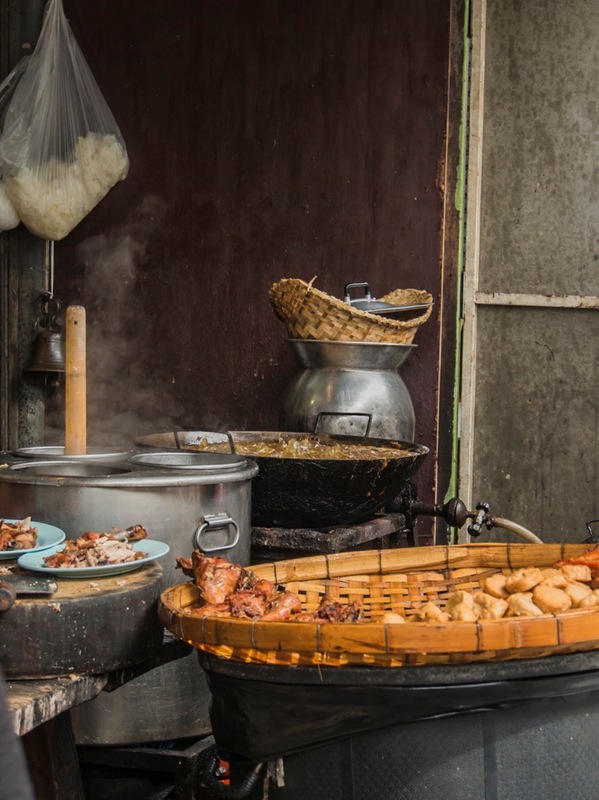 Some of the food stalls are more sophisticated than others, the one pictured below for example, almost looks like a professional kitchen! 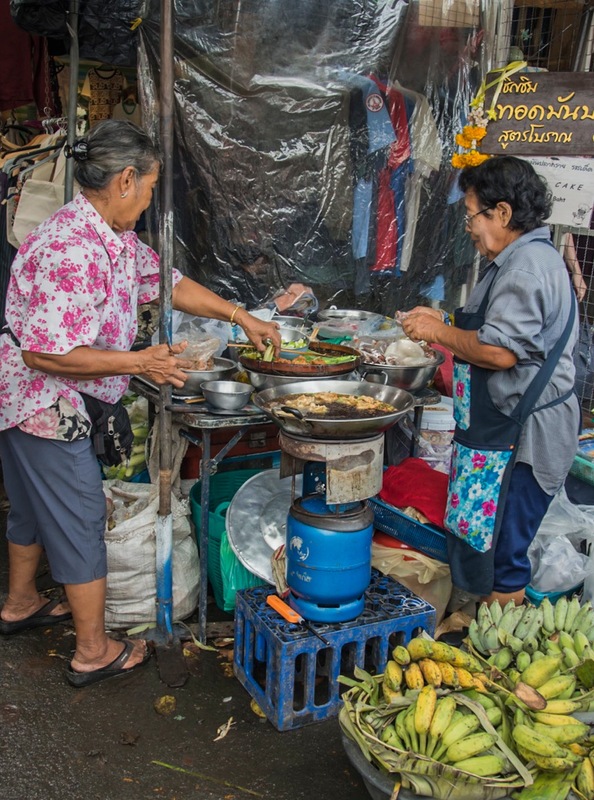 Lots of fresh seafood is available at the market, which is quickly stir fried or just grilled – yummy! 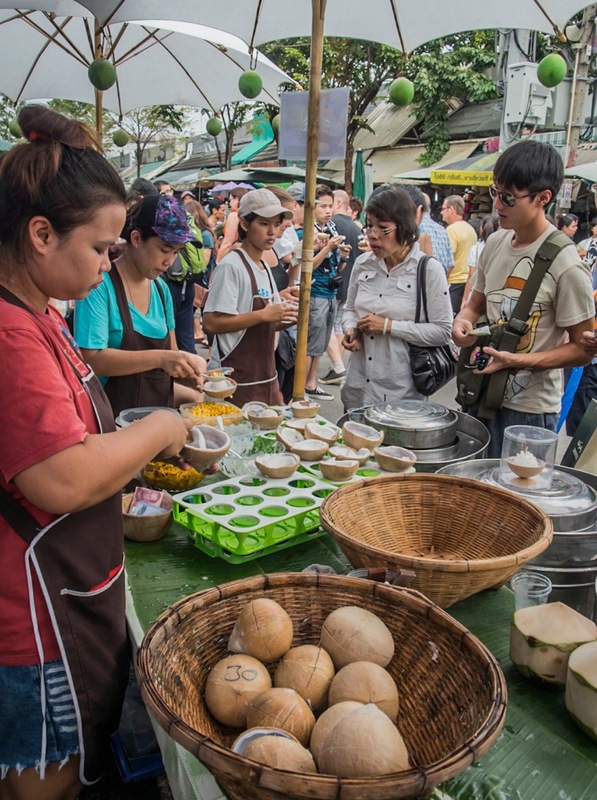 Thai cuisine has some of the most amazing dishes but also great desserts – not only do I love the sticky rice with mango, I also enjoy the freshly made coconut ice cream very much. It is not very sweet and includes lots of flesh of a young coconut, which is very soft (not chewy at all) and only has a slight taste of coconut – it is very refreshing. That’s what the ladies above are preparing, just in a small coconut shell you’ll get one scoop of fresh coconut ice cream and in the shell is some additional coconut flesh to enjoy. If you like you can sprinkle additional sugary sweets and marinated fruits on top, but I prefer my coconut ice cream plain. I had to take the last photo too – which is not food related, so don’t worry. This was not a food stall. 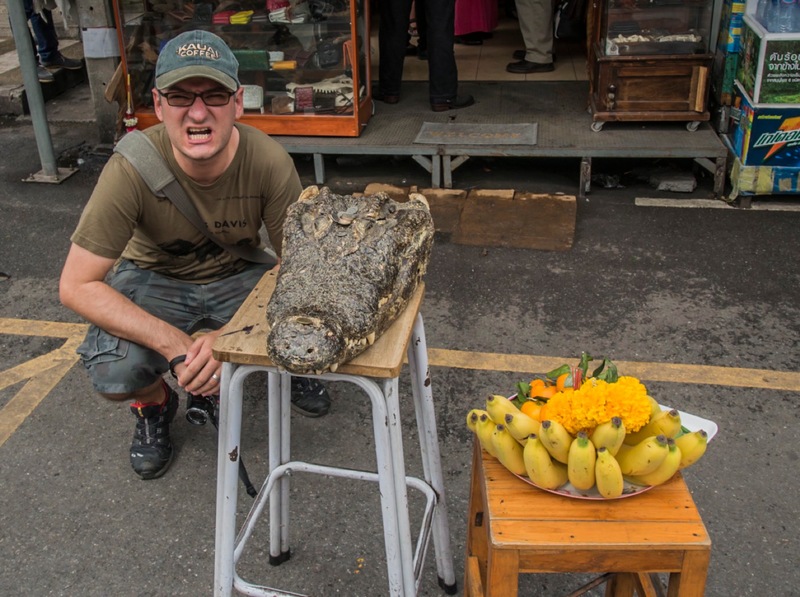 However, I don’t know why one would purchase the head of a crocodile. What is one going to do with it? Stuff it and hang it up on one’s wall and tell everyone a fabricated hunting tale? I find the crocodile head disgusting! I wonder what someone would do with it, like you already said.